In the beginning their was just one. One Civilization to rule all of earth, this civilization was an MS-DOS operating system game from 1993. The leader of the civilization, Sid Meier, had a vision. A far-fetched vision of vast expanses of land to be conquered, only anyone could do it! These vast expanses of land were found in your hard drive, and he made it his job to expand those lands into the hands of everyone (who owned an MS DOS computer). His vision became more popular than he could have ever dreamed of. Eventually the cult followers demanded more from their god. Meier had to continually pop out video games, just as a catholic mother pops out babies. Eventually the second civilization wasn't good enough for the raging masses, and they demanded a third. This empire was the shortest lived empire, and only 3 years after its release, the masses once again demanded an upgrade. Following the release of the fourth civilization, a group of rampaging Warlords decided that it was their time to shine. By implementing themselves into the fourth empire they began to wreak havoc on the otherwise peaceful members of the fourth civilization. The warlords consisted of an elite group of 6 world leaders from the past, returning from the grave. Hannibal of Carthage lead the group under a relentless rule, followed close behind by Brennus of the Celts, and Wang Kon of the mighty Koreans. Below those two stood Mehmed the second, of the Ottoman Turks, and Ragnar Lodbrok of the barbarian Vikings. And finally stood the cleaning man of the warlord, Shaka Zulu of the Zulu Empire (though he is not considered by many to be an actual threat to the fourth civilization). The fourth civilization warred for several years with the rampaging Warlords, just up until all hope seemed lost. In 2007 however an even greater threat touched the lands of the fourth empire, forcing the Warlords to reach a peace agreement with the fourth civilization, thus ending the war that had burdened the land of the fourth civilization for so many years. Do not fear the 200 foot tall hulking behemoths standing on your city. Just Ignore them. But on the 23rd day of July, 2007, a day that will be remembered forever in the history of the fourth civilization, they arrived. A giant spaceship sent from the year 2099, filled with 10 new enemies for the fourth civilization to fight off. Unfortunately this was not an easy feat to accomplish. At the time the fourth civilization was deep at war with the burgeoning Warlords, who finally agreed to sign a ceasefire until the mysterious creatures appearing were gone. After a week assaulting the alien spaceship, finally beings began to emerge from it. Hammurabi, Justinian, and Zara Yaqob emerged from the ship, with humongous armies of the damned. Soldiers, Aircrafts, and massive Assault mechs emerged from the seemingly small spaceship. 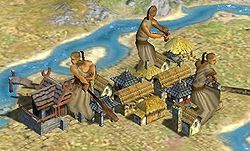 Things looked bleak for the allied armies of the fourth civilization, and the Warlords, right up until the all powerful lord, Sid Meier, synthesized 2 new leaders of prior Warlord civilizations into the game. Suleiman and Boudica brought massive armored vehicles known as Dreadnoughts. With these new machines at their disposal they were able to crush the entire Babylonian, Byzantine, and Ethiopian empires with little struggle. The Dreadnoughts continued to tear through the entire spaceship, destroying the 7 other civilizations that had not even departed yet. 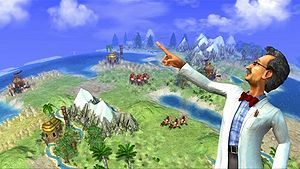 Seeing the acts that had unfolded on his earth, Sid Meier felt pity on them and decided that he would bring the 10 civilizations back to the earth, and unite all the empires under the title of the fourth civilization. With the united fourth civilization, they were finally able to continue on to new and better things. As you can clearly see from this accurate view of the earth, plantations now exceed the size of mountains. Isn't that interesting children? With over 30 empires of the fourth civilization now living in harmony, empty space was beginning to thin out. Because the entire fourth civilization was redesigned after the last invasion, Sid Meier decided that the thirty some-odd empires would live in harmony. Unable to war with each other, the empires began to seek other locations to build on. A quick failure was aerial empires, since they lacked the knowledge to keep metropolises floating continuously, they resulted in massive crashes into the earth, causing immense amounts of casualties. Their next idea quickly sank to the bottom of the ocean. But third time is a charm in their case. While watching their ocean empires sink to the bottom of the sea, they noticed a horizon that was not blue, no, it was land. An entirely new strip of islands fresh for the picking. And thus the colonization race began. All of the empires quickly began producing transport ships to bring settlers over to the "New Worlds" as they were referred to as. islands were quickly claimed by the first to reach them, some empires managed to grab several islands and island chains. However the distance from the homeland took its toll on the colonies. Oscar Wilde quotes are automatically put into the fourth civilization. Sorry Uncyclopedia. So everything ends up well and good with the fourth civilization. They have land area to prosper and are forever at peace with the other empires of the fourth civilization. But where does that leave fans of the fourth civilization? "We want War!" they yell, just outside of Sid Meier's office building. Apparently an all peace world is not what the fans had in mind. They would much rather decimated the last traces of living existence outside of their empire, completely ruling the world that they have crafted through thousands of years of war. Much as the demand for a fourth empire occurred after the conquest of the world in the third civilization, the demands for a fifth civilization have begun. And thus Sid Meier responded with the beginning of his fifth crowning achievement, the Fifth Civilization. Although it is not a public world yet, he has promised it will be one of the greatest civilizations ever to hit the internet. So until then, devoted followers of the civilization empires will have to make due with just being friends with the other empires (much to their dismay) for the fifth civilization will not be released until the fourth one is long extinct, and forever erased from the minds of its lovers. 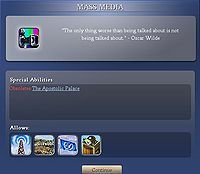 Civilization IV is part of Uncyclopedia's series on Mass Media. This page was last edited on 12 July 2012, at 03:02.